An article that came out July 11 in Philippines Star and was picked-up by Yahoo News said that DOT Secretary Alberto Lim find Boracay so dense and is alarmed by the algae that grows which he attributes to hotel and many establishments sewerage system. Asked if the government can do something about it he mentioned that there is a possibility that the government cannot halt overdevelopment in this 10.3 square kilometre paradise. I feel sad that already the white flag is being raised by our incoming Secretary of Tourism to the difficult situation that Boracay is in. What I know is that the associations and different cause oriented groups in Boracay can be called to action, most especially if the long term view is presented to them in all honesty. I should know I have talked to two of hotel operators and one government official when I was there. True! Boracay has become dense because the place has turned-out to be one of the best beach party places in the world. We cannot deny the fact that it has also created a lot of jobs. 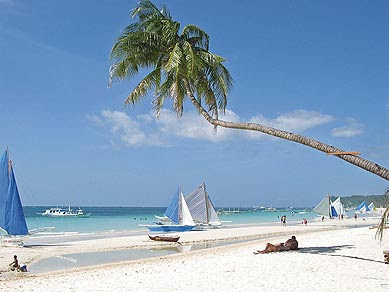 Some nearby provinces have benefited from Boracay in terms of providing jobs for their citizenry. If ever Caticlan Airport development pushes thru then we can see an additional increase of people visiting to Boracay. Seeing this possible reality, the DOT headed by our new secretary must make drastic actions. Giving-up and raising the white flag is not one of them. In the face of Boracay’s popularity and the economic benefits that it offers vis-a-vis the threat of losing the island’s beauty because of the overdevelopment I strongly suggest that a strong and firm political will must be imposed in the island. Our country has a lot of experts to craft a creative solutions to problems that bedevil the island. If there will be no under the table transactions and self interest will be pushed at the back burner, all things are possible. In India, the public-private initiatives have work wonders. I think this can also happen in Boracay’s case. Our government and the private entities that are involved sit down they must have as the guiding principle in threshing out solutions the operative world BALANCE AND SUSTAINABLE DEVELOPMENT. Again, it is not yet time to throw in the towel. Also not yet time to suggest that tourist go somewhere else in the country. All of these mean fleeing to the root of the problem. I strongly believe there are a lot of solutions to this current imbroglio; we just need to sit down and talk.